Senate Bill 1793 by Sen. A.J. 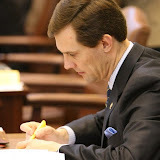 Griffin, R-Guthrie, and Rep. Jason Nelson, R-Oklahoma City, allows the Oklahoma Commission on Children and Youth to provide training programs regarding child abuse and multi-disciplinary teams that were previously administered by the Child Abuse Training and Coordination Council, which was abolished by HB 1467 in 2013. Engrossed SB 1793 allows the Oklahoma Commission on Children and Youth to provide training programs regarding child abuse and multi-disciplinary teams that were previously administered by the Child Abuse Training and Coordination Council. SB 1793 also gives the Office of Juvenile System Oversight within the Oklahoma Commission on Children and Youth the responsibility to investigate allegations that a DHS employee retaliated against a foster parent for filing a grievance or making a complaint against the Department. The Office of Client Advocacy within DHS will retain responsibility for investigating allegations of retaliation made by relative kinship foster parents against the Department.